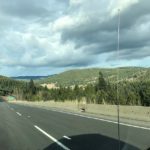 In a way in which to cover international hockey, this week sees Laird and I make a trek to the Tournament Capital of BC, namely Kamloops, which plays host to various sports – regardless of the time of year. One might expect the weather to be somewhat uncertain, but this trip had us travel on a warm sunny 14 degree Monday. The trip saw us make one stop, no not a “pit stop” but rather a stop for coffee and munches in Hope, known for movies such as Good Will Hunting (1996), Hope Springs (2003) and the more popular 1982 “Rambo First Blood” starring Sylvester Stallone produced 4 films series from 1981 to 2007. Many of the original locations used in this film are still left unchanged in Hope BC, so fans can really see and touch many of the sets and props used in the film. Once at the Sandman Centre we arranged for our media passes, grabbed a coffee (surprise) and made our way to the media lounge. A nice surprise was meeting up in the media box with Dan Courneyea who lived in North Delta a while back and also used to umpire ball with Laird – small world?? Never mind seeing one person we knew, I had my cousin Tracey (Erickson) whom I have not seen for at least 15 years swing by the media box to talk to me and talk about old times. 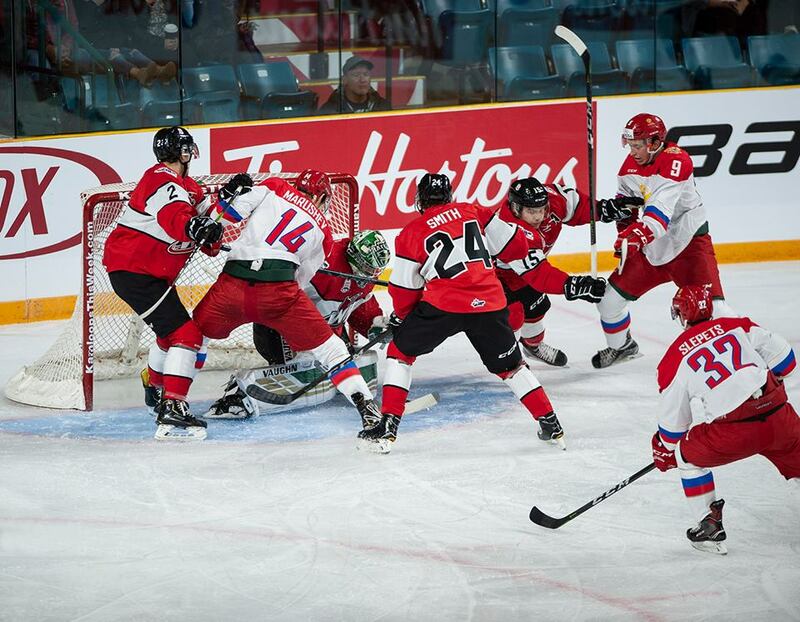 The game saw Ian Scott (6’3”) start for Team WHL and plays for Prince Albert, while Team Russia started Daniil Tarasov (6’2”) both highly touted with their respective teams. The press box was filled with scouts from various NHL teams represented as well as a couple from Russia watching the talent. The game was close to a sell-out and was played in front of 4,438 fans with some tickets still available for those arriving late, mostly due to parking issues. The CHL holds an all-time record of 61-22-1-6 in the event, winning 12 of the 15 series and this game would involve speed with no time and space for any giveaway’s, solid goaltending and exceptional play by the “D” on the back end. The CHL comes off three consecutive series victories for the first time since 2007, ’08 and ‘09. 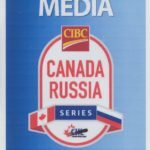 The WHL holds an all-time record of 20-7-1-2 in the CIBC Canada Russia Series, but is .500 over its last 14 encounters with Russia dating back to 2011. The CIBC Canada Russia Series returns to Kamloops for the first time since 2015 when Brandon Wheat Kings forward Jayce Hawryluk led the way with a goal and an assist in a 4-2 Team WHL victory. 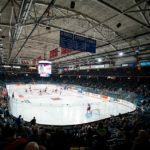 The CHL would go on to win the series 15-3 in points and another interesting stat is that Kamloops is hosting the event for a record-tying fourth time. 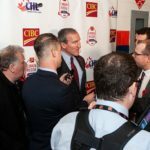 Sponsorship plays an important role for this series that has Sportsnet.ca doing the broadcast, CIBC was the main sponsor for the pair of games in BC as well as the remainder of the series. The event itself is set up as a “showcase” in which to promote future NHLers attracting scouts from various areas on the hockey world. Notes from the series include that a few members of last years WHL team went on to play important roles at the World Juniors. 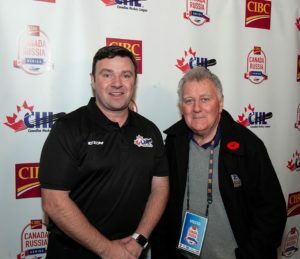 Canada’s Captain Dillon Dube (Kelowna Rockets) tied a WHL record for most points in the CIBC Canada Russia Series with five over two games, while Regina Pat’s Sam Steel notched four. Russia star Alexander Alexeyev who was selected by Washington Capitals and five others were selected in last year’s NHL entry draft, ranging from 2nd round pick to Pavel Shen selected by Boston in the 7th round. The roster has two Vancouver Giants players on the roster, namely David Tendeck, selected by Arizona and Bowen Byram who is eligible for the draft next spring. It takes more to look after a team and the Vancouver Giants are pleased to have Athletic Trainer Mike Burnstein work the bench along with Dev Mitra (Kamloops) and Colin Toledo Robinson also from the Blazers. Bench boss is Moose Jaw Coach Tim Hunter who is paired up with Lethbridge bench boss Brent Kisio and when you watch the interaction on the bench, it’s not a surprise they are teamed up. When you watch them on the bench, it’s clear to mention that Tim Hunter is no stranger to getting involved in the play and letting his voice heard by the officials, should a call not go his way, or so he thinks. 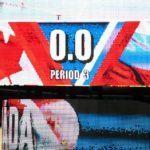 With the game coming to the end, Team Russia found themselves in penalty trouble with a short 1:45 left in regulation time. The final result saw Team WHL manage a 2-1 win as the team’s head to the Coast to play at the Langley Events Centre the following night. Long day, but overall a successful road trip.